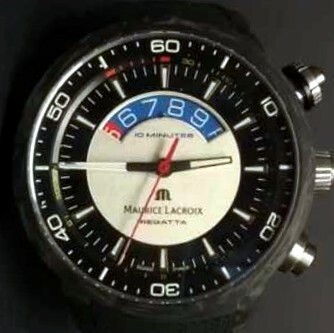 The history of Maurice Lacroix begins in 1961 with the establishment of an assemblage business in Saignelégier, Switzerland, by the parent company Desco von Schulthess AG. Initially watches were manufactured for customers under different brand names. In 1975 the first watch model under the name of Maurice Lacroix comes to market in Australia, followed by the introduction of the brand name in 1976 on the Spanish market. In the 1990’s the brand has a rapid growth in Germany, and belongs to the most successful newcomers. 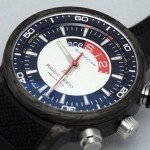 In 2001 then, the Maurice Lacroix SA company becomes independent of their former parent company. Soon after the brand introduced their first self-designed and developed mechanical chronograph caliber ML 106, allowing them to claim the prestigious status of a manufacture. 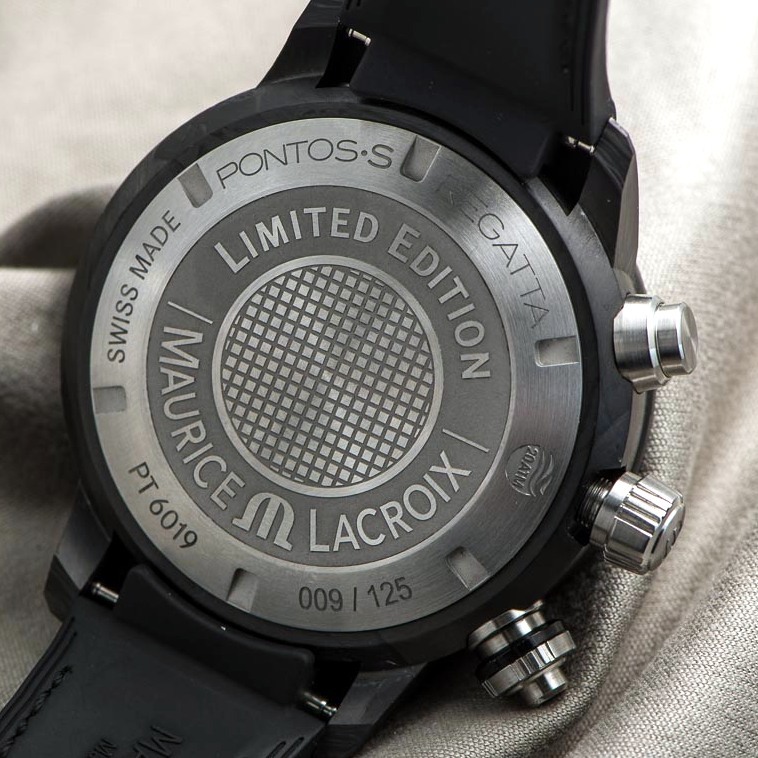 At the Baselworld Watch and Jewellery show 2015 in Basel, Maurice Lacroix presented a new model in their Pontos series: the Pontos S Regatta , inspired by the world of sailing. The dial has an arcing aperture between 10 and 2 o’clock, were the countdown is shown in figures. 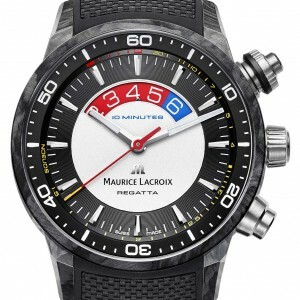 Maurice Lacroix Pontos S Regatta, limited edition. 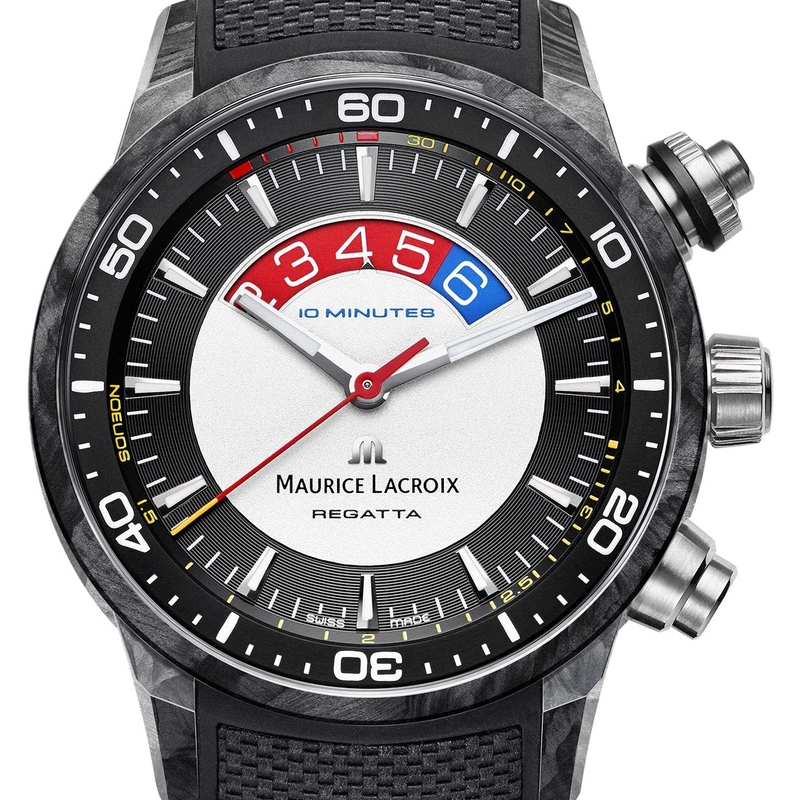 Model: Maurice Lacroix Pontos S Regatta. Reference: PT6019-CAB01-330-1 with rubber strap, limited to 125 pieces. Caliber: automatic Sellita-based movement with a Dubois-Depraz 2028 regatta module integrated. Case size: carbon composite Ø 45 mm. The large arcing aperture in the dial is positioned from 10 to 2 o’clock. Below noon is a little black triangular pointer to follow the countdown, which is presented by the indicator disk divided in 15 segments moving under the dial. The watch has a crown at 2 o’clock to set the inner rotating bezel, with a pusher for start/stop, and one pusher at 4 o’clock for reset. After a reset the disk shows 8-9-Ready in white figures on a blue background, with the pointer at Ready (10 minutes). When the chrono is activated at the first gunshot the countdown starts and the red sweep hand (with orange tip) is set in motion counting the seconds. 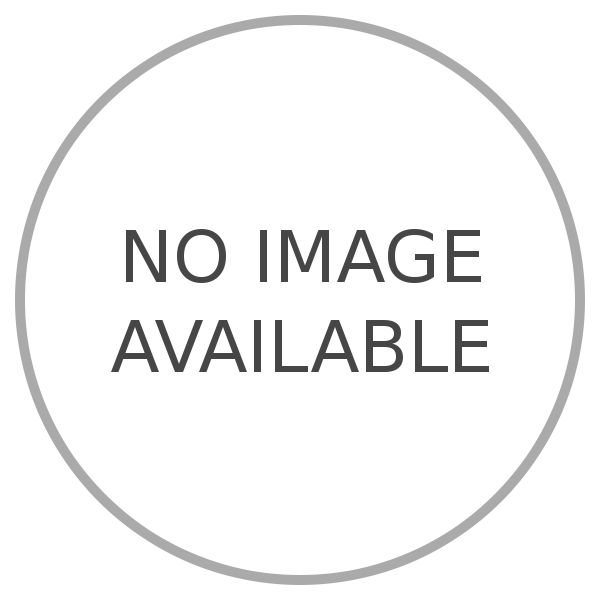 The indicator disk runs continuously clockwise, changing colours after 5 minutes to white figures on a red background. At the final gunshot, the indicator disk shows Race-S-1-2 with the pointer at S (Start). Base caliber is a Sellita SW-500 chronograph, with a Dubois-Depraz 2028 regatta module integrated. The production is limited to 125 pieces. 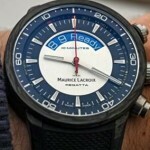 many thanks to Christiane Alice Rivoir of Maurice Lacroix for your given information per e-mail.